Mar 20 21:45: Magnitude recalculated from 4.6 to 4.9. Hypocenter depth recalculated from 98.0 to 117.0 km. 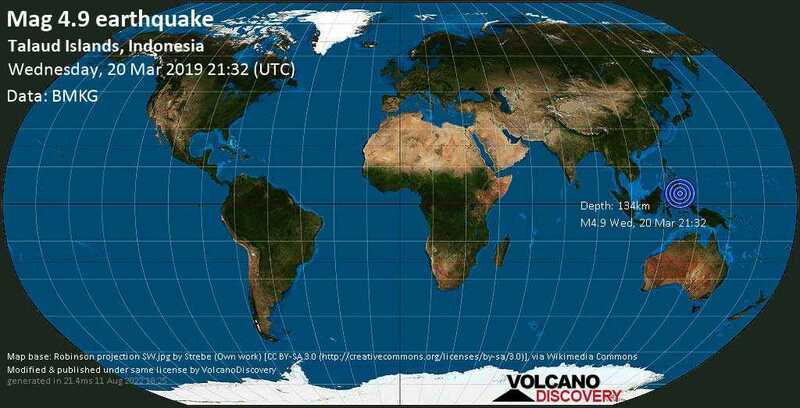 Mar 20 21:50: Magnitude recalculated from 4.9 to 4.7. Hypocenter depth recalculated from 117.0 to 127.0 km. Mar 21 03:20: Magnitude recalculated from 4.7 to 4.9. Hypocenter depth recalculated from 127.0 to 129.0 km. Hypocenter depth recalculated from 129.0 to 134.0 km.